It's 10:30 am on a Wednesday and I'm sitting at home on my couch listening to Mickey Mouse Clubhouse in the background. Why, you ask? We have a snow day today. Actually, it's a COLD day because of the -20˚ wind chill outside. It's funny because the weather is actually beautiful - well, at least from my view from the couch. There's blue skies and sunshine. I can hear the sound of birds in the air my furnace on overload. Ok, so maybe I'll continue enjoying the view from INSIDE my nice, warm house. It almost makes me wish I had a sunroom or morning room so I could pretend it was warmer outside by letting the sun pour in through the windows. I'll have to add sunroom to my long list of "Things to find on Pinterest that will probably never happen". 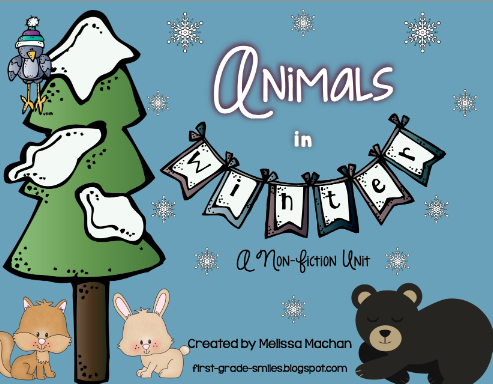 First up in this unit is an Informational Mini-Book for shared reading. 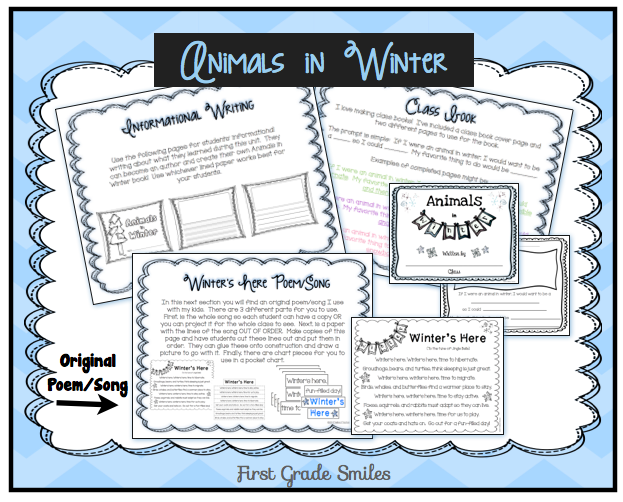 There is a color copy for you to use as the teacher and a black and white copy to make for students to have their own. I packed in a ton of important information in this book so your kiddos will be learning a lot. Good time for an impromptu observation by your principal. Speaking of being observed. . . I'm sure your principals like to see the Common Core standards in action. So I included a bunch of practice to hit those reading for information standards. You're welcome! Included in those standards is learning new vocabulary, so that's in there too. There's pieces to use when teaching the vocabulary and then a student book to fill in. 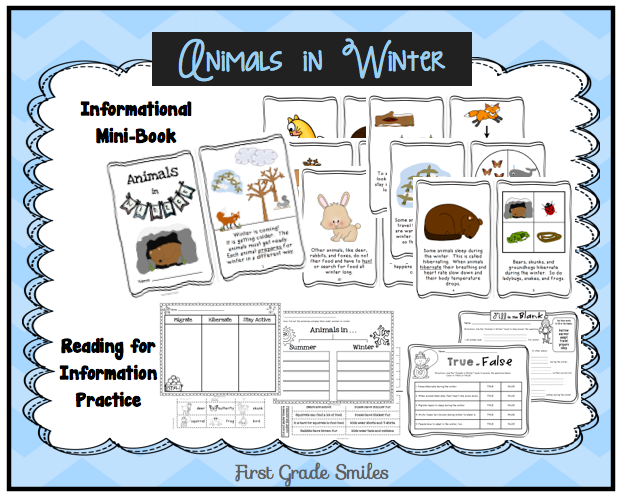 There's papers for your students to write about what they learned and make their own book. 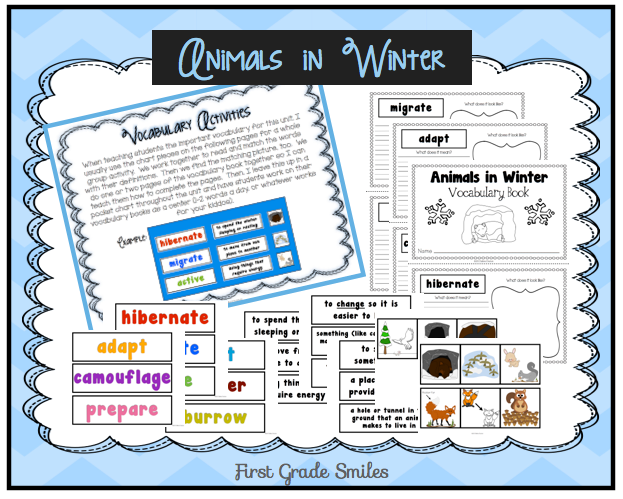 There's also templates for a class book about what kind of animal your kids would want to be in the winter and why. I also wrote a little fact filled song called Winter's Here. 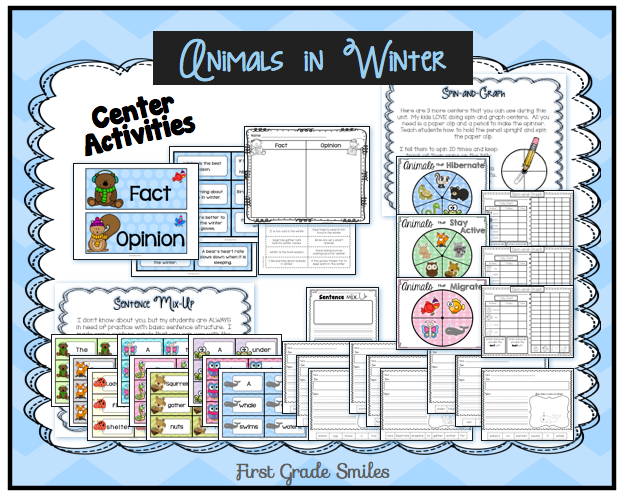 Finally, I included some center activities and printables to complete this thematic unit. Did I mention I can't wait to use this unit in the next couple weeks? Sorry to keep bringing it up, but like I said, winter is all around us here and we might as well have some fun with it. Even if you are not in the middle of a polar vortex in your neck of the woods, I hope you will find this a useful unit too. Click on the cover below to check it out on TpT. And because I don't want to punish you for not following me on Facebook or TpT and I DO want to thank you for visiting my little blog --- I will do a Pin it to Win it giveaway for those of you who keep coming back to visit me here. I truly am so thankful for your time and support!! So go ahead and pin any image from this post and then leave me a comment with the pin URL and your email. And because I LOVE reading your comments - let me know what winter is like where you live right now: Are you freezing in the vortex or wondering what this polar vortex thing is? Crazy how cold it is this year! I'm sure Las Vegas was a little bit different than single digits =) Thanks for the pin! You know I'm right there in that polar vortex with you! Unlike you, though, I was not very productive today, haha. It's only 9pm… I still have a few hours left to get something done!